I’m just gonna come right out and say it: these tacos are totally dreamy. Ben is rather easy to please when it comes to tacos; wrap anything up in a tortilla (corn, low-carb, even lettuce) and he’s one happy dude. Me, on the other hand, I need the right ingredients. 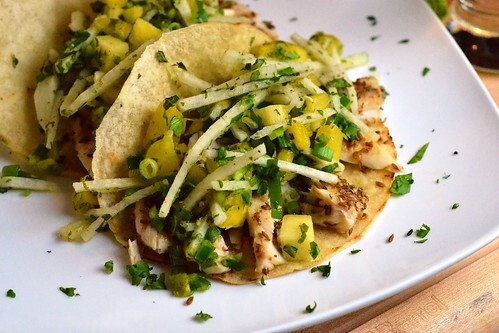 Not just anything makes a good taco; there has to be the right balance of flavors and textures. And now I’m just gonna brag: I totally hit it with these ones. Once you’ve got that combo down, and combine it with a crunchy slaw of crisp jicama and sweet pineapple, trust me, you’ll wonder why you ever ate another fish taco. As if you need any more convincing, check out the nutritional stats and ingredient list and you’ll discover that these are surprisingly low in fat and sugar, and gluten-free and dairy-free too. Head over to Clean Eating Magazine for the full recipe! First, should you desire more gluten-free, dairy-free, or other allergen-free recipes for yourself or your kiddos, you’ll want to check out a very cool iPhone app created by my friend Kim at Cook IT Allergy Free. 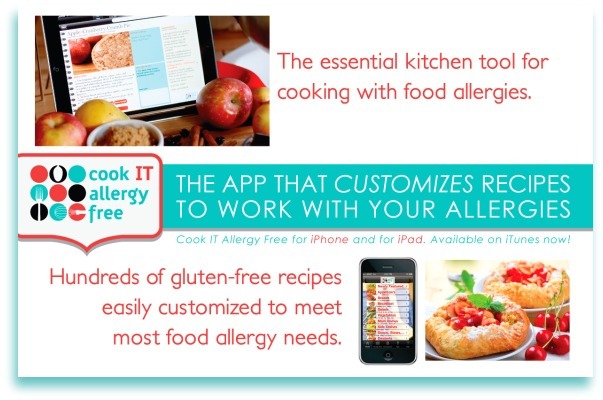 The Cook It Allergy Free iPhone and iPad apps allow you to select from hundreds of gluten-free, kid-friendly recipes and further customize them to meet your needs. Can’t eat eggs or dairy, perhaps? A simple touch will give you a choice of tried and true substitutions. Furthermore, you can select and customize a set of recipes for the entire week, and the app will spit out a personalized grocery list even organized by aisle! How’s that for a time saver? The app is interactive, too: feel free to give feedback on which substitutions worked best for you, and in turn improve the experience for others. Maybe you’re thinking, “that’s cool, but my family can eat gluten, dairy, soy, etc. What do I need this for?” Food allergies are on the rise, and most likely, your child has some classmates who can’t enjoy all the same foods that he or she can. Wouldn’t it be nice to be able to prepare meals and snacks that everyone can enjoy when your child’s friends come to play? If you’re not used to preparing food for special diets, a simple, handy guide like this could be your new best pal. Kim has even included a video to show you how easy it is! Seriously, you’ll want to check this out. For the month of September only, the app is on sale for $3.99 for the iPhone and $6.99 for the iPad. If only I had an iPhone, I’d scoop that up right now! Lastly, the winner of my Tropical Traditions giveaway for a 32oz jar of Gold Label Virgin Coconut Oil was Laurel. Congratulations! Thank you to everyone who entered, and as always, for taking the time to visit here and read. It truly makes my day. Want your own coconut oil? You’re still in luck: This big jar is currently on sale for $29.50. I promise, that’s a great deal for this amazing coconut oil. Need to pick up some unsweetened shredded coconut or coconut flour? They’ve got great deals on that too. Need some more ideas on how to use your coconut oil? Check out these great recipes your fellow readers had to share! These look fabulous! Been wanting to try some jicama in some form. Thanks! Those tacos sound wonderful! I can only imagine how amazing that slaw tastes, too! I have to go over to Clean Eating and check out that recipe. And I cannot thank you enough for sharing my App with your readers. I so totally appreciate your generous words about it! Seriously! I have to say that I haven't shopped much at Indian grocery stores, but Asian grocery stores are great in the same way. Loving all of these Clean Eating recipes you are whipping up. Yum! So pretty, Cara. Love the herbs scattered about! 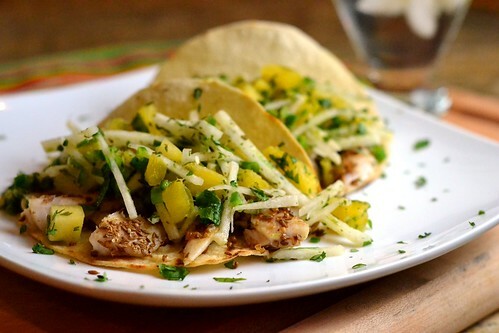 A bit bummed that I didn't win the TT coconut oil, but those tacos have my stomach growling! We're doing tacos next week for dinner – but with Tempeh instead of Mahi. These tacos look wonderful, Cara. I'm thinking they'll be on the menu for next week! We love seafood tacos in this house. Our local World Market sells small packets of spices at a very reasonable price. I usually purchase my spices there, then I can keep them fresh for a reasonable cost. The tacos look great! I love the combination of flavours and textures you have used! I'd like these for dinner tonight. Maybe I'll just make that happen! Gorgeous photos!